You, Me and Movies: Review: Kurt Russell dazzles in the ordinary "Christmas Chronicles"
Review: Kurt Russell dazzles in the ordinary "Christmas Chronicles"
If Netflix has proven anything in 2018, its that they are really starting to push their budgets towards some big material, and they are really starting to draw some big, exciting names into their playhouse. I still really love "The Ballad of Buster Scruggs" by the Coen Brothers. I never would have guessed that the Coen Brothers would make something for a streaming service, but never say never, huh. Not only that, but their movie could very well end up in the Oscar race, which would be big for the streaming service. We are also getting "Roma" and "Mowgli" later this year, and those feel a little bit bigger than average for the streaming service. They seem to be moving forward in a big way, making some ambitious choices. I can see that even more with "The Christmas Chronicles," a big-budget Christmas spectacle. A movie that has a dozy of a Kurt Russell performance in it. Its a movie you can curl up on the couch with your whole family to watch. Which I am sure will appeal to many. There are moments of laughter, and moments of sincerity. Its the perfect type of movie to watch with your family this year. And when you don't have to brave the cold weather (the snow and the cold sure came early in the Midwest this year), and when you don't want to pay so much for movie tickets and snacks, this can be a wonderful alternative. I'm sure kids will find much of it funny. What will parents think? Well, I am sure it depends on the adult in question. Some may think its a Disney Channel movie that's a little quirkier than usual. Darby Camp and Judah Lewis play Kate and Teddy Pierce. They are two siblings who have had a happy home for many years, that happiness is rattled with the sudden death of their father. Teddy, the oldest, becomes a rebellious sort, and a bit of a juvenile delinquent. Kate is still very much wrapped up in the magic of Christmas, simply because it makes her think of her father so much. One night, the two are home alone as mom has been working much harder to support her children. When Kate thinks she sees Santa Claus, the siblings hatch a plan to capture him at their house when he comes down the chimney. Sure enough, they capture Santa Claus, and after some running around chasing him through their neighborhood, Santa has lost his reindeer and is sleigh. 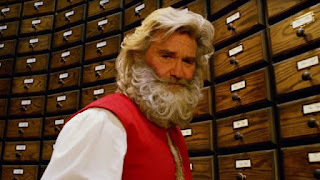 The problem is Santa, played by Kurt Russell, has only a few hours left in order to deliver the rest of the presents around the world. If he fails, people will begin not to believe in him. A non-belief in Santa Claus led to the Dark Age and some other darker moments of our history, so Santa can't stress enough how important it is. So he enlists the help of the Pierce children to find his items. The movie that follows is pretty straight forward. Like I said it plays like a Disney Channel type movie. Even a kind of Halmark type episode. All of the movie's big themes are easy to follow. The big reveals can be seen a mile away. There is nothing that is going to surprise the audience here. Even the ending cameo is easy to pinpoint. What makes the movie fun is just how much fun Kurt Russell is having as Santa Claus. It's pretty clear that he's having a ton of fun, so the audience goes along with him. This is a Santa Claus that will steal a sports car to catch up with his reindeer. This is a Santa that knows your history and thoughts. He will tell you what is a myth about his mythology and what is fact. It's a fun, modern interpretation. Had the movie focused on this different Santa and not brought in the cliche storyline with the children, I think the movie would have been stronger overall. But let your families decide this film's history in the family movie pantheon. This could be a big step forward for Netflix and I can't wait to see what others think of this one.